The last holdout of history. 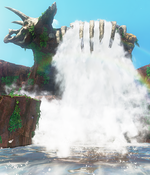 The Cascade Kingdom is the second kingdom visited in Super Mario Odyssey. It is the greater location of Fossil Falls, which is a prehistoric dinosaur-themed area. The main landmark of this kingdom is the waterfall flowing down from the skeleton of a Triceratops, while its background appears to be inspired from the real-life Iguazu Falls located between Argentina and Brazil. Mario first arrives in this kingdom via a spark pylon located on top of the Top-Hat Tower in the Cap Kingdom, which snaps upon his exit. When he arrives here, he is introduced to the game's main collectible, the Power Moons, as well as the Odyssey, a hat-shaped airship used to travel between the game's kingdoms. During his first visit here, Mario must defeat Madame Broode in order to collect a Multi Moon, which is used to power up the Odyssey and allow it to travel to the next kingdom - the Sand Kingdom. 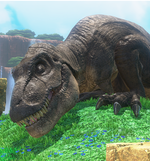 The Cascade Kingdom is one of the few kingdoms in the game that does not have any known residents, even though dinosaurs, and in particular T-Rexes, are known to live there. It is located east of the Cap Kingdom and west of the Sand Kingdom. Concept Art of Fossil Falls. To give the impression that there was going to be a magnificent adventure, Fossil Falls was designed with impressive elements such as a spreading blue sky, a huge waterfall, and a T-Rex. The main difference between the concept art and the final design lies in the sleeping T-Rex wearing a red top hat and the presence of pterasaurs flying in the sky. There are many waterfalls in the Cascade Kingdom, but the area known as Fossil Falls is a special one. There are few sights in nature as grand as the millions of gallons of water pouring every second out of this giant triceratops skeleton. Like a huge axe planted in the ground. The stone spire standing near the great falls has miraculously remained balanced upright in this position, presumably for eons. Of particular interest are the cubes of unknown material embedded in the stone. There cubes are the reason for the common theory that the spire somehow fell from the sky. While this theory is difficult to prove, it is equally hard to doubt when looking at this miraculous stone structure. What secrets hide within the barrier? No ordinary cliff face, this structure was carved out painstakingly over many long years by people unknown. The wall is composed mainly of fossils, and evidence suggests it has been broken many times, causing some to suggest that something is buried inside. Visitors are encouraged to explore the mysteries surrounding the Great Barrier, if they dare. Researchers believe this specimen is female. The biggest draw for tourists to this area is that dinosaurs still live here. Many people willingly put themselves at considerable risk for a glimpse of the ancient "terrible lizards." T-Rex, most terrible of all dinosaurs, can pulverize a boulder with a single blow. On the other hand, most people don't realize how much time they spend napping. Old, but not as ancient as its surroundings. No one knows how a Bonneton-style structure got buried here. Bonneters travel often, so they may have lived here in the past. It is a helpful landmark if you get lost, though. If you look closely at the stone walls, you will notice fossils mixed in. Think of it as nature's mosaic, and remember it always. Experience the glory of nature with the eye-popping Great Falls. See dinosaurs, prehistoric rulers of a bygone age. Find treasures of the past, tucked away everywhere you look. Dinosaur Nest Red door Down the staircase-forming platforms south of the "Top of the Big Stump" Checkpoint Flag A spacious underground area where Mario must capture a T-Rex and smash all the rocks and Burrbos to obtain a Power Moon. Chain Chomp Cave Warp Pipe In the wall behind the northwestern plateau A cavernous area consisting of three partitioned rooms full of Chain Chomps among pools of poison. The method to progress plays out similar to a billiards game, in that Mario must capture the nearest Chain Chomp and hit it against the other Chain Chomps so that the last one hits a hole in the back wall, with the last room earning him a Power Moon. A hidden, fourth room lies beyond the exit, which holds another Power Moon. Chasm Lifts Area Red door To the right of the Stone Bridge from the Checkpoint Flag An 8-bit area situated over a large chasm. Mysterious Clouds Moon Pipe Just northwest of the Stone Bridge Checkpoint Flag A platforming area featuring Cap Clouds, pendulum-like lifts, and many Burrbos. Gusty Bridges Moon Pipe At the Odyssey's original location A platforming area featuring bridges activated by throwing Cappy at Lever Switches or being pushed back and forth by towers blowing wind at them, and many Burrbos. 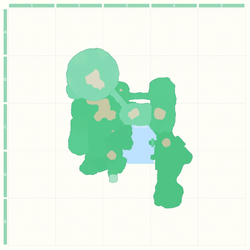 Enemies marked with an asterisk (*) are only found in bonus areas. Our First Power Moon: The goal is to obtain the first Power Moon found by the Waterfall Basin. Multi Moon Atop the Falls: The goal is to defeat Madame Broode to obtain the first Multi Moon. There are two paintings in this kingdom. At the right side of the bridge near the Odyssey, there is a small cave with some regional coins that can be accessed by swimming to it. Inside, there is a painting that leads to the Island in the Sky at Bowser's Kingdom that can be only entered after completing the main game. 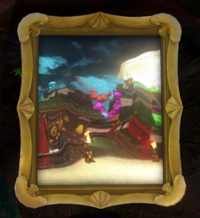 The other painting is located at the Island in the Sky, which can only be accessed from a painting in the Seaside Kingdom or the Snow Kingdom. The Cascade Kingdom has yellow Power Moons. There are a total of 42 Power Moons (39 regular Power Moons and 1 Multi Moon) in the Cascade Kingdom. During the player's first visit to this kingdom, they can collect 16 of the Power Moons and the Multi Moon. After the player leaves this kingdom and comes back (at any point), 2 more Power Moons are available to collect. The player can also collect a Power Moon if they travel to this kingdom using a painting found in a future kingdom (either the Snow or Seaside Kingdom). One additional Power Moon can also be found when the player encounters the Tostarenan tourist in the kingdom. After the player defeats Bowser in the Moon Kingdom, 4 more Power Moons become available to collect. The Moon Rock will also be available to destroy, causing 15 additional Power Moons to be accessible. In order to power up the Odyssey and progress to the next kingdom, the player must collect at least 5 Power Moons. The Cascade Kingdom contains 50 regional coins, which take the form of stone wheels. A new level inspired by the Cascade Kingdom appears in the Nintendo 3DS and Nintendo Switch versions of Captain Toad: Treasure Tracker, where Captain Toad needs to drive a Mine Cart and shoot Vegetables. Biddybuds appear as enemies in the level. Daineopol Literal translation of the Japanese name. Kǒnglóng pù Literal translation of the Japanese name. 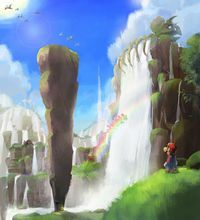 According to Kenta Motokura, the Cascade Kingdom was at least partially influenced by Super Mario World, another game where Mario is alongside dinosaurs. Thematically, the Cascade Kingdom may have potentially been influenced by the 1990 science fiction novel Jurassic Park. Similar to the Cascade Kingdom, the novel takes places on a lush, Latin American island inhabited by dinosaurs. The T-Rex's design is reminiscent of the Tyrannosaurus rex from the film adaptation of Jurassic Park, rather than to what the animal might have actually looked like. 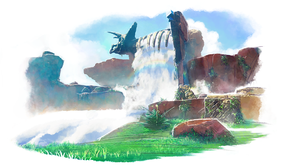 ↑ Post about the concept art of Fossil Falls from the official Japanese Super Mario Odyssey Twitter account. Retrieved May 9, 2018. ↑ Nintendo. (June 15, 2017). Super Mario Odyssey - Co-Op Demonstration - Nintendo E3 2017. YouTube. Retrieved June 19, 2017. ↑ Jacqueline Ronson. (May 20, 2016). The Tyrannosaurus Rex Had Lips and It Probably Didn't Roar. Inverse. Retrieved January 5, 2018. This page was last edited on February 26, 2019, at 13:12.